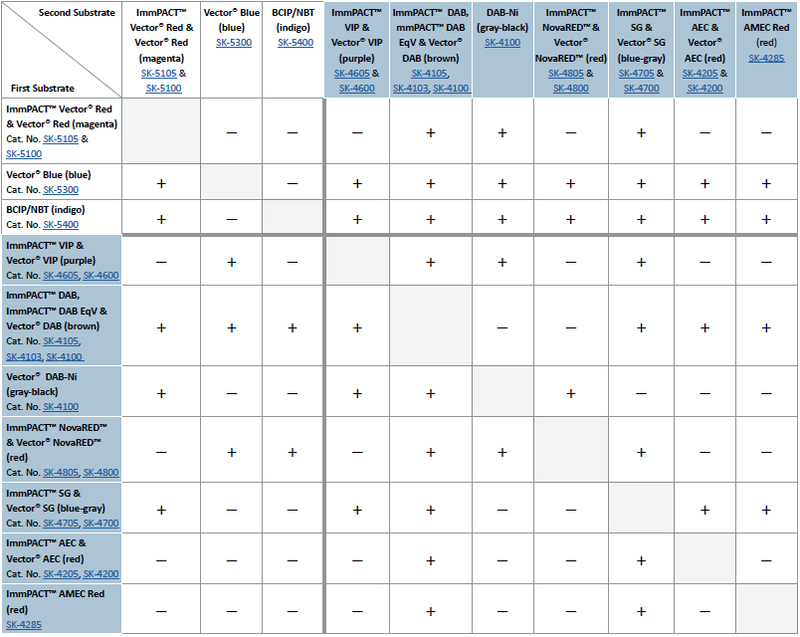 Recommended combinations of substrates and the recommended order in which they should be used. 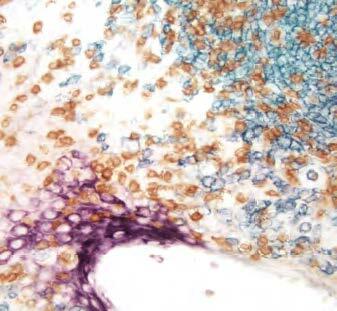 Breast Carcinoma: • Estrogen Receptor (m), VECTASTAIN® Elite® ABC Kit, Vector® NovaRED™ HRP substrate (red) • CD34 (m), VECTASTAIN® ABC-AP Kit, Vector® Blue AP Substrate (blue) • Cytokeratin 8/18 (m), VECTASTAIN® Elite® ABC Kit, Vector®DAB HRP Substrate (brown). Tonsil: • CD3 (m), ImmPRESS™ Anti-Mouse IgG Reagent, Vector® VIP HRP Substrate (purple) • Ki67 (m), ImmPRESS™ Anti-Mouse IgG Reagent, Vector® SG HRP Substrate (blue/gray). 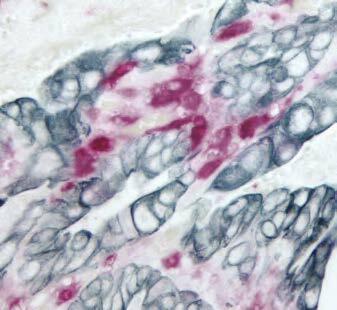 Prostate: • Cytokeratin 5 (m), VECTASTAIN® Universal ABC-AP Kit, Vector® Blue AP Substrate (blue) • CD34 (m), VECTASTAIN® Universal ABC-AP Kit, Vector® Red AP Substrate (red). Colon Cancer: • Ki67 (rm), ImmPRESS™-AP Anti-Rabbit IgG Reagent, Vector® Blue AP Substrate (blue) • Cox2 (rm), ImmPRESS™-AP Anti-Rabbit IgG Reagent, ImmPACT™ Vector® Red AP Substrate (red). 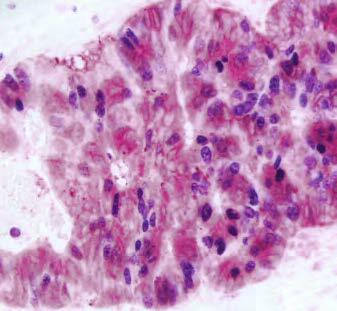 Colon: • Ki67 (rm), ImmPRESS™ Universal (Anti-Mouse/Anti-Rabbit IgG) HRP Reagent, Vector® VIP (purple) • Cytokeratin (m), ImmPRESS™ Universal (Anti- Mouse/Anti-Rabbit IgG) HRP Reagent, Vector® SG HRP Substrate (gray). 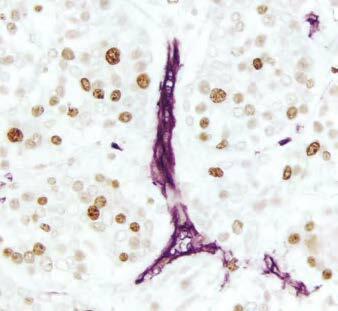 Breast Carcinoma: • Ki67 (rm), ImmPRESS™ Reagent (HRP; Universal), Vector® DAB (brown) • CD34 (m), ImmPRESS™ Reagent (HRP; Universal), Vector® VIP (purple). Melanoma: • Cyclin A (m), ImmPRESS™-AP Anti-Mouse IgG, ImmPACT™ Vector® Red AP Substrate (magenta) • Melanoma Marker (m) ImmPRESS™ HRP Anti- Mouse IgG, Vector® SG HRP Substrate (gray). 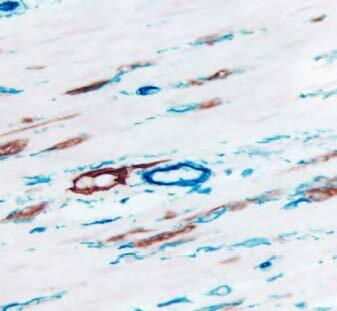 Note contrast of double stain with the brown pigments in the tissue. 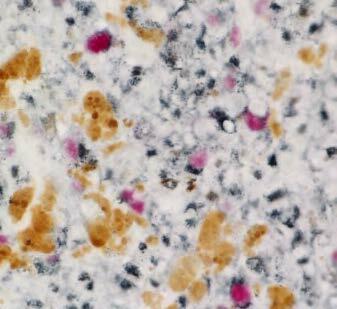 Tonsil: • CD3 (m), VECTASTAIN® Elite® ABC Kit (Universal), Vector® DAB (brown) • CD20 (m), VECTASTAIN® Elite® ABC Kit (Universal), Vector® SG (blue-gray) • Multi-Cytokeratin (m), VECTASTAIN® Elite® ABC Kit (Universal), Vector® VIP (purple). 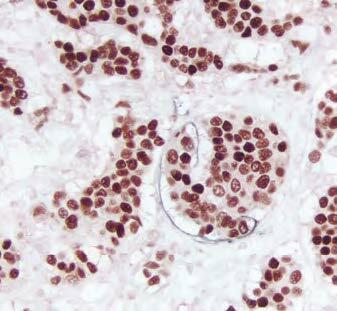 Breast Carcinoma: • Estrogen Receptor (rm), ImmPRESS™ Universal Reagent, Vector® NovaRED™ HRP Substrate (red) • M2A Antigen (m), ImmPRESS™ Universal HRP Reagent, Vector® DAB+Ni HRP Substrate (gray/black). 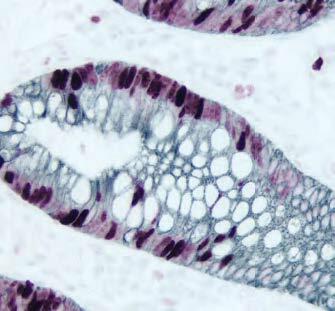 Colon: • M2A Antigen (m), ImmPRESS™ Universal (Anti-Mouse/Rabbit IgG) HRP Reagent, Vector® NovaRED HRP Substrate (red) • CD34 (m), VECTASTAIN® Universal ABC-AP kit, Vector® Blue AP Substrate (blue). Colon Carcinoma: • S100 (rp), VECTASTAIN® Universal ABC-AP Kit, Vector® Red AP Substrate (red) • Cytokeratin 8/18 (m), VECTASTAIN® Universal Elite® ABC Kit, Vector® SG HRP Substrate (blue/gray).